With a month to go until Election Day, your campaign is far from over. You still have a lot of hard work ahead of you. That said, there are going to be a few things that you’ll need to do quickly after the election. With of the excitement that will surround your impending win, we want to cover this topic as early as possible so that you’re prepared. It may seem like the end of your campaign is nowhere in sight, but trust us that it is right around and will be here before you know it. If you prepare now to take these steps, life will be much easier in November, and you’ll be able to focus more on your life as an elected official. Let’s start with wrapping up your campaign. Thank Your Supporters, Volunteers, and Donors. These are the people who powered your campaign. They took time away from their lives to help you, and they deserve your first bit of attention to appropriately thank them in the coming days. If you haven’t already, send a thank-you email to your entire email list making sure they know you won and how much their support made a difference. You should also write or call dedicated volunteers and donors individually to express your gratitude. 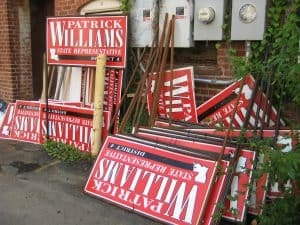 Make sure to remove your yard signs, placards, etc. from any and all public locations. Some cities will fine you if yard signs are left in public medians after a certain date. You can even ask your volunteers for one last hour to help your campaign to remove everything. Most election authorities require a post-election and/or end-of-year financial report. These are typically pretty similar to the reports you’ve been filing all election cycle, but if you’re closing out your campaign committee there might be additional paperwork required to make that official. Determine What to do With Your Campaign Committee. Depending on your state and local rules, you may have the option to keep your campaign committee active, suspend it or close it altogether. There is no right answer about what to do here. If you won, keep your committee open. You’ll have costs in the off-year and will likely raise money in advance of your re-election. If you are thinking about running again, keeping your campaign committee open means you can legally continue to raise money throughout the cycle (especially if you’ll be in office) and the start-up phase of your next campaign would be easier and quicker. But you will probably have reporting requirements and other obligations in the interim. If you close the committee, you will need to open a new one if you run again. When you go this route, make sure you don’t forget to close your bank account, too. If you have any money leftover, determine your options are for zeroing out that balance: Can you donate it to another candidate’s campaign (and earn some political points in the process)? Or donate it to a community charity? Info about who moved that volunteers learned during GOTV could be really valuable to other candidates (or you) later on, so make sure you have entered all of your field and financial data into NGPVAN or whatever database(s) or spreadsheet(s) you’re using. Additionally, some states require that candidates retain certain financial and other records for a given period of time. Make sure you have talked to your lawyer about data retention requirements or at least thoroughly reviewed the guidance your election authority provides before getting rid of or deleting anything. If you want an extra reminder on why data is so important in your campaign, read a recent blog on the subject HERE. Once you’ve met your legal obligations, compile your donor and volunteer lists into one workable document for future usage. I know you’re probably not ready to decide whether you’ll run for (re)election again, but if you do, the last thing you want is to have to start from scratch building relationships and cultivating donors. If everything’s already in spreadsheets, you may want to compile those so you have the essential information all in one document that lives outside of your campaign email and infrastructure. If you used a database on the campaign, talk to your vendor about your export options to get the data you may want later into a spreadsheet or other format that you’ll be able to access without the software. Make a Plan for Your Digital Presence. Now that you’ll be an elected official, you’ll need to build your digital presence in a new way. Each state has their own laws pertaining to the use of different social media accounts based on which “hat” (e.g. your campaign hat or your government official hat). Contact your local election authority if you’re unsure about this. Since you have a little while before you officially take office, now is a good time to think about how to go about your digital life as an elected official. to register voters, and/or hang signs. you might spend 20 minutes trying to remember it–so write it down and save it. Adjust or Cancel Your Accounts/Subscriptions. Based on your next steps, consider whether you will need to retain access to various databases or other services you’ve had on the campaign. If you will keep them, could you downgrade the service level to make them cheaper for a while? If you lost and aren’t running head first into another campaign right away, you probably want to cancel or suspend any software and other accounts you have (e.g., NGPVAN, database software). As good Democrats, make sure you recycle any old materials you have. However, first you need to shred any old walk/call lists, or anything else you have that has voters’ or volunteers’ personally identifiable information (e.g., addresses, phone numbers) on it. And then dump those shreds in the recycling bins. Finally, if you won and are going to take office in a couple weeks or months, you should also start making a plan to govern. What you will prioritize? Who you plan to work with? You’ll probably start with the core issues you talked about in your campaign message, but there might be interim steps you need to take before you can tackle those. These include relationships to build, community groups to consult, folks in government to talk through implementation with, etc. This process will take time and should also be done with the help of those around you. What’s important to note here is that just like you made a plan for running your campaign including timelines, goals, and people, your plan for governing should be just as comprehensive. For more information and resources about this, DMO–the organization dedicated to engaging and supporting Democratic Municipal Officials–is around to help!